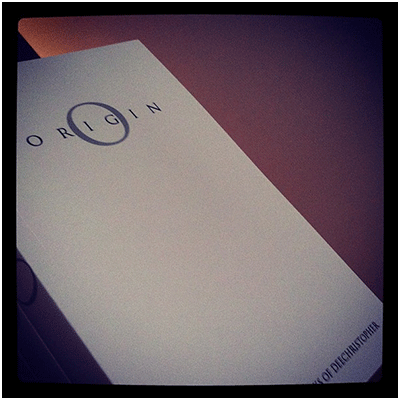 With Origin, I've compiled the vast majority of my signature work (including exclusive work unavailable anywhere else) in magic and mentalism, a multitude of effects and essays over 280 pages. 5020: Become a human lie detector! LOKI: Determine which poker chip resides in which of your Spectator's pockets with no peeking and no gimmicks. TURNOVER 23: Place down an odd backed prediction of a named card and be right every time! SYLLACODE: A two person coding concept. MORSE: A spectator as mind-reader effect. SYN: One coin bends visually as the other bends in a spectator's hand. They will admit to feeling it bend EVERY TIME. MIRROR: Is it possible to predict a spectator's shuffle? It is now. MACHINE: An incredible demonstration of automatic writing. One spectator thinks of a word and the other writes it without knowing how! THE NEW BLACK: A thought of word is written on a thought of ESP card, sat in an envelope in full view! TURNOVER BEND: A spoon bending technique. SIX:SIX: A unique forcing technique based on a very old magic effect. EX: Prove that you know what item would be named before it is. DICHOTOMY: FINALLY, an Out of This World that can be done effectively in the hands! SEVENS: A spectator pushes an envelope freely into the spectator shuffled deck. The card in the envelope matches the card they find in the deck! ASHES: Any named suit burns. IMPRINT: A simple marking system. LEGION: An expandable concept with cards that needs to be set up only once and can create completely hands off forces, hallucination effects and more! CRONOS: A full locked box prediction system that also allows you to perform an incredible feat of psychokinesis! TECHNOKINESIS: Push a button on a Blackberry phone with your aura. THE TOUCH: A two person coding concept that will work everywhere and anywhere, under any conditions. SCAR: Visually HEAL a scar on your hand! EPOCH: Know the date and value on any coin handed to you from within your closed fists. CAST: An amazing booktest gimmick that fits in your wallet and is completely invisible in plain sight! DREAMCATCHER: A full impromptu thought reading routine with a great premise! VANITY: The veins in the back of your hand visually twist themselves into thought of initials!